Ne-Yo is to become a father again as he and girlfriend Monyetta Shaw are expecting their second child together this autumn. The Miss Independent singer already has a 10-month-old daughter Madilyn Grace and told People he is loving fatherhood. Ne-Yo gushed at his annual Compound Foundation benefit in Manhattan: "It has been a ride, but I'm loving every minute of it. "She's been trying to walk since she was two months old. "She'll grab your hands and pull herself up and do a little wobble dance. She likes scooting along the wall. She moves really fast." But the 31-year-old singer and actor revealed his young daughter is already showing diva tendencies. He said: "She definitely knows her worth - which is a beautiful thing. That's something I've tried to instil in her from day one: understand that you are a Godsend.You're an absolute angel and people are supposed to treat you that way. She's extremely diva even at 10 months. "She's a growler right now. She'll only let you hold her a certain way." 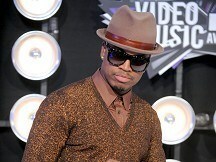 And Ne-Yo revealed Maddie is yet to be a fan of his music. He laughed: "Daddy loses out to Mickey Mouse Clubhouse. She loves the Hot Dog! song by They Might Be Giants. She knows two words: 'Dada' and 'hot dog'." Eliza Doolittle will perform at a pop concert to round off a day of events to promote peace and the London 2012 Olympic Truce. Wretch 32 revealed he is backing the Stand Against Violence campaign because he wants to make the streets safer for his children to grow up in. Italian teen opera stars Il Volo have revealed their dream of collaborating with Celine Dion and Britney Spears. Tony Bennett celebrated his 85th birthday with a star-studded concert at the Metropolitan Opera House in New York. Adele could make up for the disappointment of losing out on the Mercury Prize after being nominated for a string of MTV Europe Music Awards.